As more and more adventurous tourists visit Peru every year to hike the trails around Cusco and visit Machu Picchu, opportunities to escape the tourist trails and walk lesser known and less crowded paths are becoming few and far between. Fortunately there are still some hidden gems in this area of the Andes. Trails where often the only other people you will see are the local farmers and their families, going about their daily routines as they have for generations. Here at Vicuña Adventures we specialize in trekking experiences that truly take you ‘off the beaten track’. The Lares trek takes us deep into an area that has changed very little over the last 500 years. This remote and rarely visited region offers the trekkers an insight into the real lives of Andean farmers, who still dress in their traditional brightly-colored ponchos. 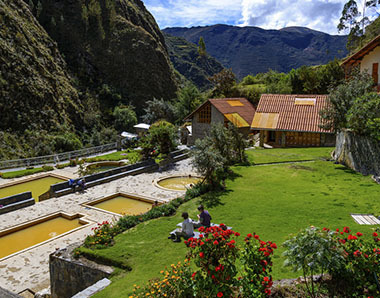 You will have the opportunity to see thatched stone farmhouses surrounded by herds of llamas and alpacas. We are often invited to take a look inside the house's kitchens, and here you will see guinea pigs running loose as the farmer’s wife prepares the family meal. The trek itself is about as challenging as the Inca Trail, and similarly promises spectacular mountain vistas, visits to iconic Inca ruins and the most awe-inspiring night skies seen anywhere in the Southern Hemisphere. Always in the company of our first-class guide, porters and kitchen team, you can be assured of an exciting, comfortable, unforgettable trek. After 3 days of trekking we rest comfortably on our final night in a hotel in the small town of Aguas Calientes. Our tour then concludes with a visit to one of the most iconic places on the planet, and one of the 7 New Wonders of the World, the sacred Inca citadel of Machu Picchu. The day before the trek you will meet with your guide and meet the members of your group. Your guide will explain the trek to you, the route, and will provide all of the necessary recommendations depending on the season you make the trek. CUSCO – huaran vilage- cancha cancha-aqopata. We will pick you up early from your hotel to take you to the beginning of the trek at Huaran (3,000 m/9,840 ft) in the Sacred Valley; it is 1 ½ hours by private bus. We will pack the horses and start to walk northward. The trail climbs gently following the Cancha Cancha river towards the community of the same name. On this walk along the river we will see cultivated fields and pass through old Polylepis forests. This type of vegetation is very interesting for a wide assortment of bird life, and the valley itself is very impressive. We will have lunch half way through the hike. We will pass by the village of Cancha Cancha (3,956 m/12,976 ft). on the way to our camp. After a total hike today of around 6 hours we will reach our campsite for the night at Acopata. ACOPATA - PACHACUTEQ PASS - KISWARANI. After an early breakfast we will continue up hill. After 2 ½ hours we will reach the highest point of the trek: Pachacutec Pass is at 4,780 m/15,678 ft. The view from here is overwhelming. The Pitusiray and Sahuasiray snowcapped mountains will be right in front of us. Now we will hike downhill for 2 hours until we reach our lunch spot, next to a captivating lake. Today we follow another valley and climb up to the second pass at Willcaqasa mountain (4,458 m/14,622 ft) , for 2 to 3 hours. Again the view of the Andes, turquise lakes and its beautiful valleys are amazing. After the pass we walk downhill for 1 ½ to 2 hours, passing many gourgeous lakes. This takes us to Cuncani village (3,900 m/12,792 ft). We then continue downhill for 2 to 3 hours towards the Lares Valley and its hot springs, where we can have a well deserved soak. This is also our lunch spot. Now that we are fully relaxed, we will get in our private van, which will be waiting for us, for the 3 hour drive to Ollantaytambo (2,792 m/9,158 ft). we will take train to Aguas Calientes, Upon arrival you will check in to your Room and Dinner in Aguas Calientes. We will wake up very early to take the first bus to the city of Machu Picchu where we will be the first visitors of the day to enjoy the magic and mystery of one of the new wonders of the world. The tour with your guide will take around 2-3 hours. After that, you will have free time to explore the city on your own. In the afternoon, we will take the bus down to Aguas Calientes to board the train back to Cusco. Finally our transfer will be at the train station waiting to bring you to your hotel.